"First off," I say, "I don't remember you being British the last time we talked, bud." This dude - whoever he is - has just popped up all random-like in the middle of my house, and he wants me to do him a favor? He's got another thing coming. "It's part of the agreement, innit?" he posits, his London dialect dripping with condescension. "Contract terms stated I'd hold on to your soul until I found a use for it. Well, I've found a use." "Come on, man." I say. "Not fair. I'm right in the middle of something." "The contract doesn't care if you're in the middle of something, Evan." The Devil leans against a wall, picking dirt from underneath his fingernails. "You can't give me, like, a month or something to clear it up?" "Unfortunately, no," he says. "Don't you want to know what the favour is?" "Not particularly." I honestly don't care. I got assigned a new project at work recently, and I'm actually kind of into it. Plus, Gina, one of my co-workers, is co-point with me, and I've been trying to get to know her better. Legs for days, eyes as big as saucers, and a smile that seems as genuine as her smarts. I get up from my couch and head for the kitchen. Dinner calls. "I'm going to tell you anyway, Evan." The Devil follows closely behind me. "I need you to go to China, attend a party, go home, and that's it." I'd be lying if I said my interest isn't piqued. It seems simple enough, but nothing is ever simple with the Devil. Grabbing a Tupperware container from the fridge, I stride over to the microwave. "I'm going to need more information than that. You and I both know that's not even close to 'it.'" The Devil rolls his eyes. "Fine, you're going to be killing a diplomat, and it's going to start a war." I scoff. "That's what I thought." The lasagna that I've pulled from the refrigerator has a small bit of mold on a corner. I cut it off and survey the rest. "Well?" The Devil crosses his arms. "How will I be killing this diplomat?" I put the Tupperware in the microwave, set it for 3 minutes. "Poison," he says. "Undetectable, and it won't be traced back to you." "And how would I gain access to the party as well as proximity to the diplomat?" I query. "As you well know, I'm not so much in the proper socioeconomic place to make my presence at this party normal." I gesture to our surroundings. I like to call my apartment decor "shabby chic," but I know deep down that it was more shabby than it was chic. Abused Ikea furniture fills the space spartanly, and ratty old carpet stretches from wall to wall. The Devil smiles. "That will be my final gift to you. You do this final favor for me, and not only do you get your soul back, but you also get a new identity with a background that is rooted in wealth and privilege." "And the catch?" I ask. "What if I fail?" "Oh, no real catch really," he says. "If you fail, you'll continue in your current life. No changes. 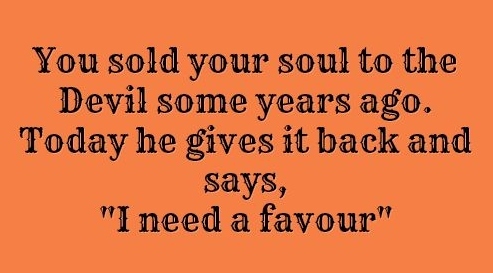 I most likely won't ask you for a favor again though." The Devil shrugs. "You seemed to be the best option. The easiest one. To be honest, if you decline, I have millions of other subjects to call upon." I sigh. He's right. He has a giant network of souls at his disposal, and this will probably be my only chance of getting my soul back. I point at him, "And you promise that it won't be traced back to me? Once I kill him, I'll be free to start my life as this new person?" I narrow my eyes. "Draft a contract." Well, there we have it! What did you come up with?